The e-book is currently FREE on both Amazon and Barnes and Noble. I’m very hopeful that this will allow several of you will to read along with us (or join us for the mid-month discussion, if you’ve read the novel before). It’s time for the February book choice. Since the poll for February’s book ended in a tie, JoyLynn is using the tie to choose our book for the next 2 months. And, since the series associated with this book starts mid-February, I figured we’d start off with this one! We’re very hopeful that several of you will choose to read along with me (or join us for the mid-month discussion, if you’ve read the novel before). Want to read along with us? Pick up a copy of the book from Amazon or Barnes and Noble or your local library. Watch in the middle of the month for a Scrap Your Read Challenge. One participating layout will receive a $5 giftcard to Amazon or Barnes and Noble, and have their layout featured in next month’s blog post. 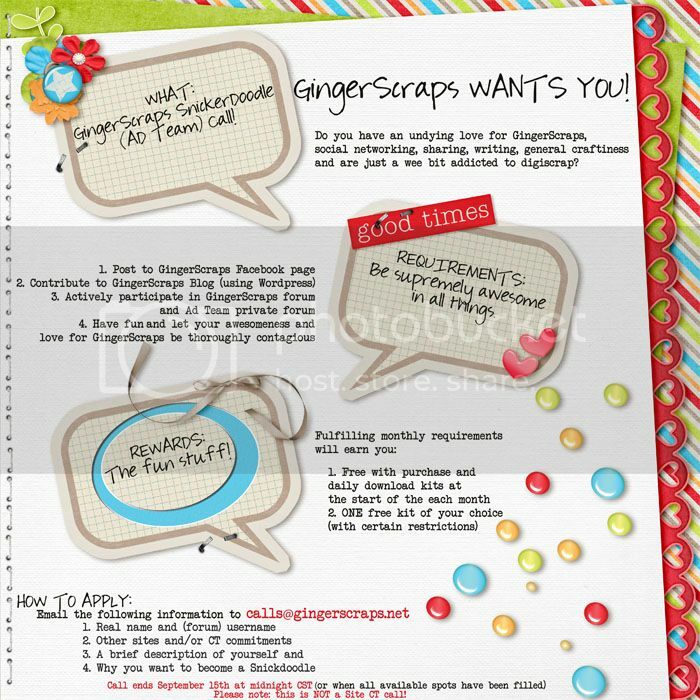 Did you know that GingerScraps had a book club? Well, we do. Head over the forum and check out the Hey Good Bookin’ area of the forum. For January, specifically check out the Book of the Month. 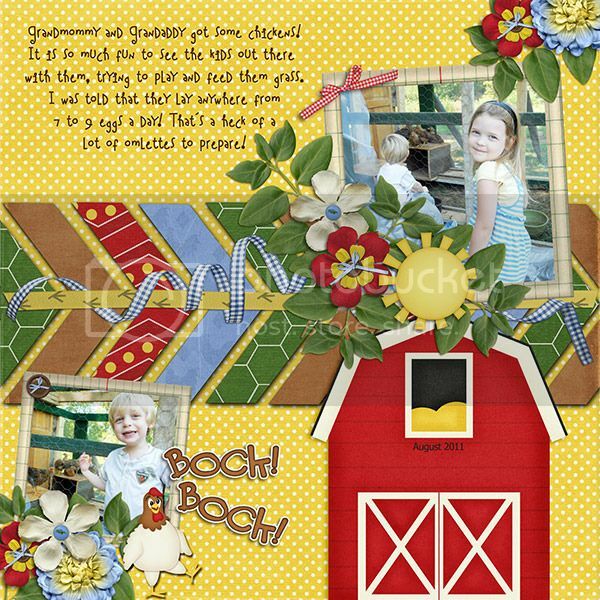 This month JoyLynn (our own Blue Heart Scraps) has chosen “The Shack by William P. Young“. Want to help pick out February’s book? JoyLynn has added a poll to the forum. Click on over and add your vote. Don’t put it off. JoyLynn will close the poll on January 10 so that there is plenty of time for everyone to pick up the book voted on. Weekly Wrap-Up: oh hey there July! How did you get here so soon? I know, a little too much for a Sunday morning, eh? Well, I’m riding on a fictional high- been in a reading frenzy lately! It all started with our Book Club read for July, Unwanted by Neal Shusterman. I’d love just to pour out all my thoughts on this book, and for a young adult book, WHEW! it’s RIPE with topics to discuss until our brains melt, however I’ll save all the **spoilers** for the discussion thread. 😉 After I finished that book I picked up another, devoured it and am onto my third book in four days. But, wow, enough about me. Recap! This week has been busy busy busy starting with last Sunday up until this point. First week of July, DONE! It’s a little bit scary how fast it’s flying by. We’ve all drooled over the new buffet, Away We Go! 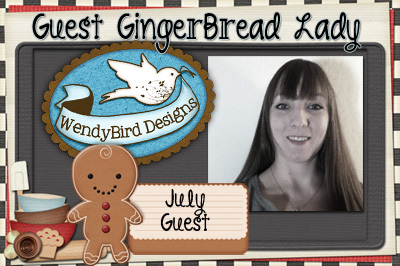 (oh admit it), been given a whole boat load of new challenges, PLUS new releases from our fantastic designers on top of it all AND our July Guest Designer: Wendy of WendyBird Designs! I asked Wendy to tell us a smidge bit more about herself, since she’s so awesome an all. How long have you been working with Hybrid(where did you start/how)? I have always loved art and being crafty and I tried paper scrapping when my son was born, but it didn’t “stick” lol… I discovered digi scrapping in 2008 and fell in love! It didn’t take long for me to miss the hands on crafting, so when I started doing hybrid crafts in 2009, it was a match made in heaven! Best part about designing hybrid templates? I love seeing digital kits printed and brought to life into 3D projects! I also love seeing how other crafters find new ways to use my templates! I love to try new recipes! I have a few dog eared cookbooks, but mostly I find recipes online – especially pinterest these days! Some of my favorites are shredded beef tacos and BBQ pulled pork sandwiches that cooked in the crock pot while we were at work – because after working 10 hours, the last thing I want to do is stand in front of the stove. e-book! I have a Nook Color and love it! I still have a collection of my favorite “real” books, but anything I buy now is electronic! I also do a lot of driving and listen to audiobooks to pass the time. I usually have 3 books going at a time – one on my Nook, an audiobook for me, and one that I’m listening to with my son. I’m so glad he inherited my love of reading! Do I have to choose just one? I like coffee, but only with a lot of flavored creamer (my boyfriend teases me that it’s just coffee flavored milk). In the winter I drink hot tea and iced tea all year long! If there is anyone who could get me to really try a full on hybrid project, it’s Wendy. 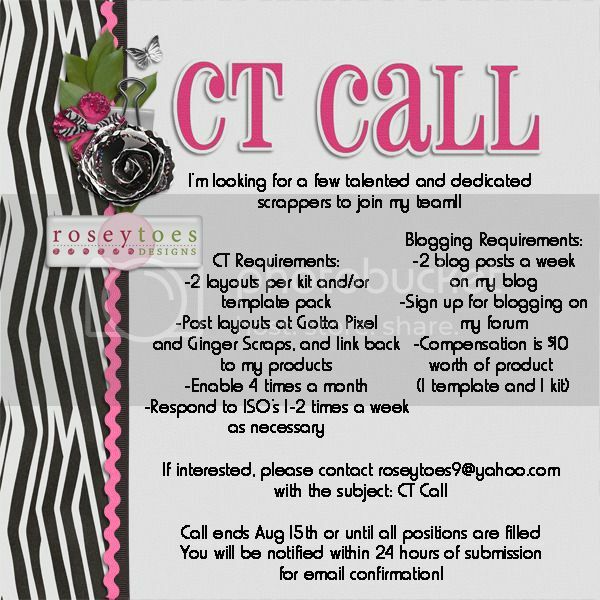 Check out her hosted hybrid challenge this month. Banner(s). Need I say more?! So what do I have next for you? How about a whole bunch of sales!? First up JenC Designs is wrapping up her Celebration Sale! You can save 40% on everything! 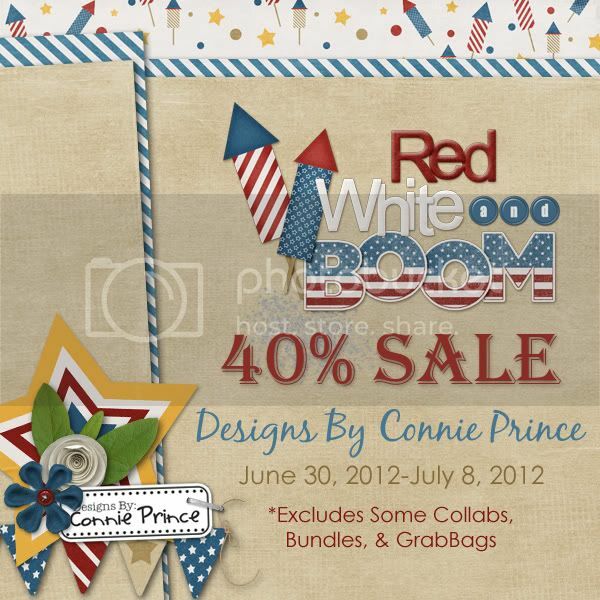 Next, today is the LAST day of Connie Prince’s Red, White &BOOM! sale! 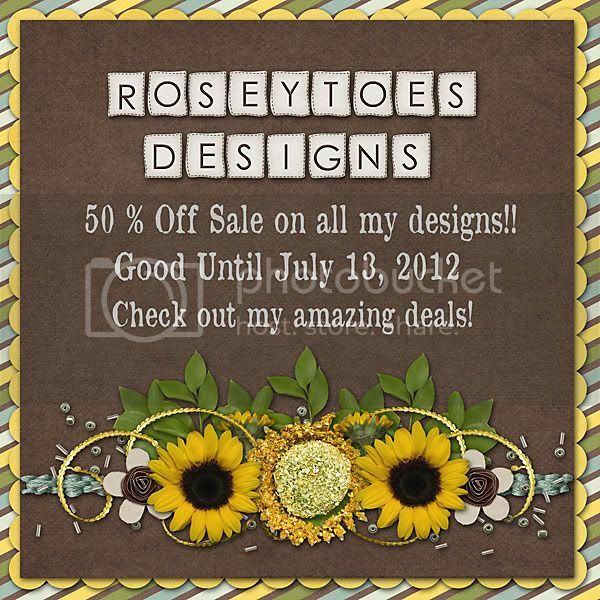 Roseytoes Designs is having a store wide sale, everything is 50% OFF! We will miss you Susie but hope to see you around the forum(s)! Okay, new buffet, challenges and guest designer? Check. Sales? Check. Try to entice you into joining in on the Book Club fun? Check, check. Aside from continuing to welcome all the new friendly faces I keep seeing pop up in the forum, that’s all I’ve got for you today! I hope everyone has had a terrific weekend, that we’re all hiding out in our caves from the heat and scrapping to our hearts content! So… stay scrap happy friends and keep on scrappin’ on. Before I start, let’s take a small moment and think of, say a little prayer for, those people and families in Colorado right now who are fighting the wild fires- the actual emergency crews and the people being displaced, losing their homes, businesses and so on. They are all certainly in my thoughts. I’ll admit, it’s been a wee bit crazy for me this morning including disassembling the vacuum because it sucked up part of my phone case, yes I’m serious. So what do I have for you today? A few little sneak peeks that’ll have to hold you over until Sunday when you get to see the AMAZING new July Buffet our designers have whipped up for you. For real, I’m ecstatic! So without further rambling from me let’s see what I’ve got! Here is a new one from Pixels by Jen. I am super serious about that number paper! And that lined paper! PAPER PAPER PAPER! Maybe that’ll be my new addiction? Here’s one from Twin Mom Scraps. I am such a sucker for stars and though it’s tucked in behind those cute flowers, I am lovin’ that little firework rocket! Looks to me like this new kit will be perfect for our impending American holiday! I am oogling all these pretty papers from Unforgettable Moment’s new release! I love the neutral, earthy tones of Unforgettable Moments’ kits and this is no exception. Love the color pallet. 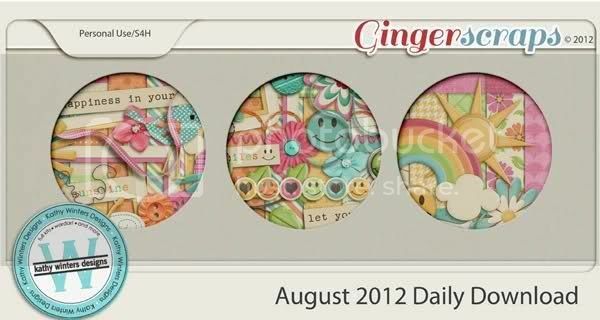 Check out this super cute kit by Connie Prince! I love that little barn! And the chicken! And the ribbon! Those are some seriously awesome peeks at what’s to come I think. Not as many as we might be used to but I PROMISE you there is more coming. You just wait and see! I don’t want to leave you just yet! I’ve got a couple other things I want to share with you. TONIGHT is our Book Club Chat and I hear there is a participation prize! Even if you haven’t read our June Read (The Lucky One by Nicholas Sparks), you can still join us for a “spoilers chat” as one lovely forum member put it (love it!). 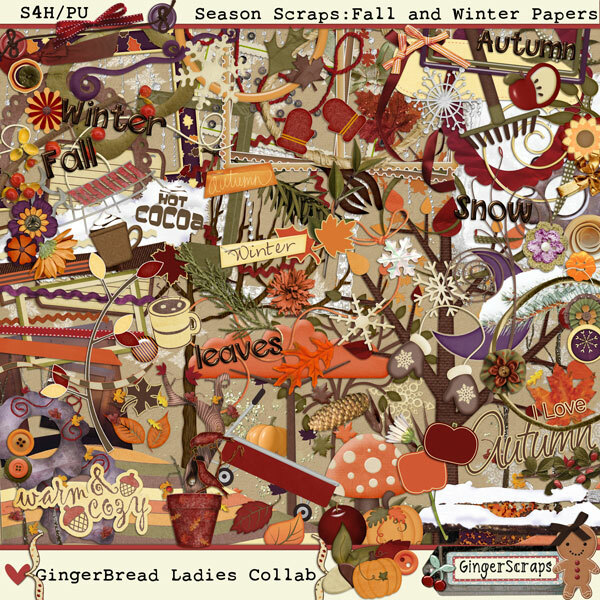 Chat is hosted by our lovely JoyLynn of Blue Heart Scraps. All information listed right ^ ^ up there. 😉 Hope to see you there! If you just can’t wait for the chat tonight, then do jump into the June book discussion thread in the forum too! 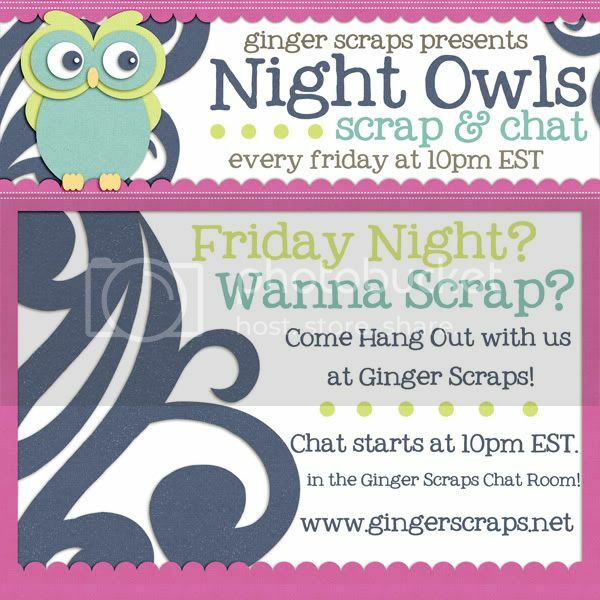 I also hope to see you Friday night at the Night Owls Scrap & Chat! Okay okay, NOW I think I’m done. 😉 It’s going to be a hot one today here at home- and I’ve been hearing from quite a few members of our community that it’s been a scorcher for them as well throughout the week. In my opinion, perfect day to stay in the AC in scrap scrap scrap! 🙂 Which is exactly what I intend to do! Weekly Wrap-up: Happy Father’s Day! And a very happy Father’s Day to all the daddy’s out there! Young, old and gone from us but never forgotten! A friend of mine posted this on Facebook this morning, “Blood relations don’t make you a Dad… love does.” So let’s not forget all the step fathers, foster dads and adoptive daddies out there too! I can’t wait to see the new Father/Dad inspired layouts that are sure to pop up in the gallery in the next couple days (I know I’ve got one in the works myself!)! For today though, I hope you’re all spending time with family! With that said, I’ve got a date with my little guy today (Daddy is out of the country on business, so we’re going out to play!) which means we’re going to have a short but sweet weekly wrap-up! So, let’s get to the good stuff yeah? How about a sale?! Amy Peck- Unforgettable Moments is have a store-wide sale in honor of her son’s third birthday! I’d say birthday’s are an excellent time to celebrate with a sale! Unforgettable Moments ENTIRE store is 30% off from now until June 22nd! How about ANOTHER sale!? Don’t thank ME (but you can, if you want), thank Sophie of Keep In Touch Designs! She’s put her WHOLE store on sale for 50% OFF! Her reason? “Because of Father’s day, because the sun is back in my garden, because I’m happy” That’s good enough for me! Have you been reading this month’s book club book? I know I’m totally behind and if you are too we’ve got a little more than a week to get our reading done in time for the chat! 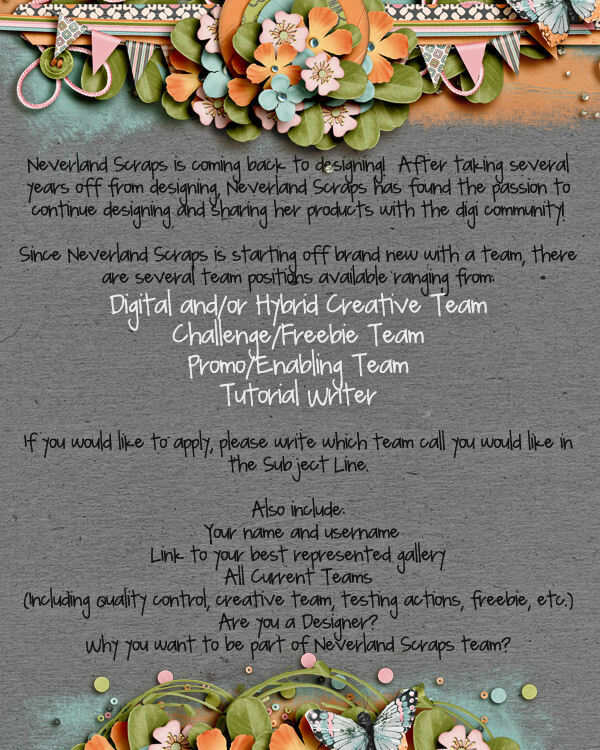 Haven’t started at all and want to join in still? Check out the thread for June’s read: The Lucky One by Nicholas Sparks. Otherwise get ready, because June 28th is our monthly book chat hosted by JoyLynn of Blue Heart Scraps! If you can’t make the chat, do not hesitate to participate in our discussion thread! If you’re already ready for NEXT month’s book, the polls have been closed and the book chosen! Our read for July is Unwind by Neal Shusterman.